The Royal Treatment: MLB Gaming 2008! Does anyone make an annual rush to the Blockbusters and Hollywood Videos of the world to purchase the latest in MLB gaming? 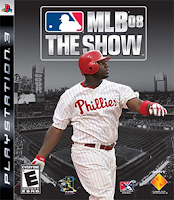 MLB 08: The Show promises to be the most comprehensive and best baseball game since MVP 2005 (my personal favorite). consistent hitting, and conversely penalizes them for prolonged slumps. settings and use those settings to quickly find online opponents. - As well, the ability to save gameplay, while still in game. custom soundtrack for the game. Lizzy, Franz Ferdinand, Kenna, and More. Some good indie action. Is anyone psyched for the upcoming season in MLB gaming? I plan on purchasing this tomorrow or Saturday, and I'll let you know what I think. Also, who's up for a K.C. Royals dynasty getting periodically posted - and updated - here on TRT? I'm loving it!